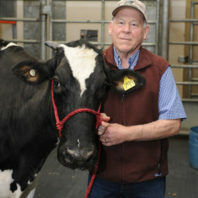 Dr. Steven Parish served as a liaison between the College of Veterinary Medicine and the Department of Animal Sciences, in which he was instrumental in providing top-quality veterinary support for the WSU Knott Dairy Center, Ensminger Beef Cattle Center, Swine Center, and Cattle Lab. Dr. Parish graduated from WSU with his DVM in 1973 and played a vital role as a faculty member in the WSU College of Veterinary Medicine, including the 17 years he served as the head of Food Animal Clinical Services. Dr. Parish received the Outstanding Professor Award 11 times, the Distinguished Teacher Award four times, the Student AVMA Teaching Excellence Award, and the North American Outstanding Teacher Award because of his dedication to teaching. These teaching contributions included guest lectures for dairy and beef production courses in Animal Sciences. As a researcher, he engaged in over 65 research projects that resulted in more than $2 million in combined funding. Several of these projects included collaborations with Animal Sciences faculty and students. He contributed over 130 publications to his field and provided more than 130 presentations at national conferences, as well as livestock producer meetings. He was among the team that received the USDA Secretaries Honor Award for Excellence in 1998 for the development of a preclinical test for scrapie in sheep.